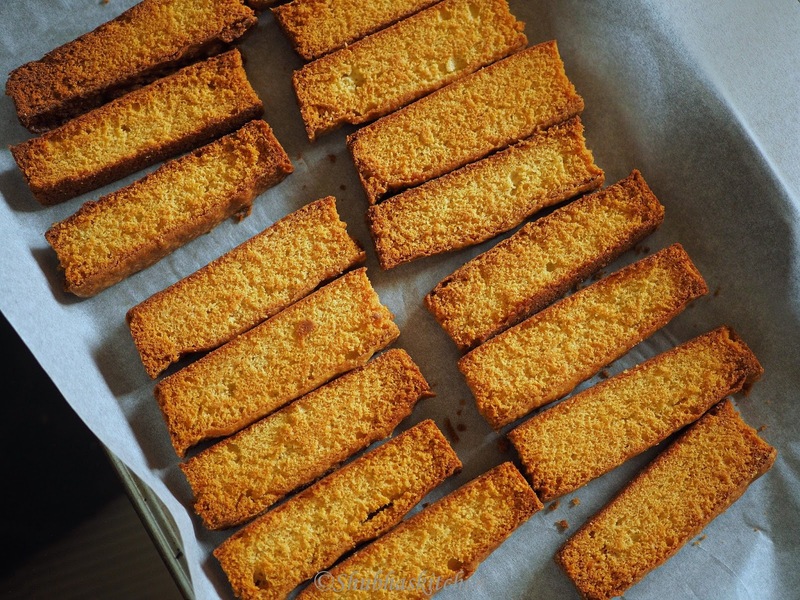 Like Biscotti, the process of making cake rusk, involves baking two times. Cake batter is prepared and baked. Once the cake is ready, we allow it to cool. We then cut slices and bake them again until we get a nice golden color and a crisp texture. 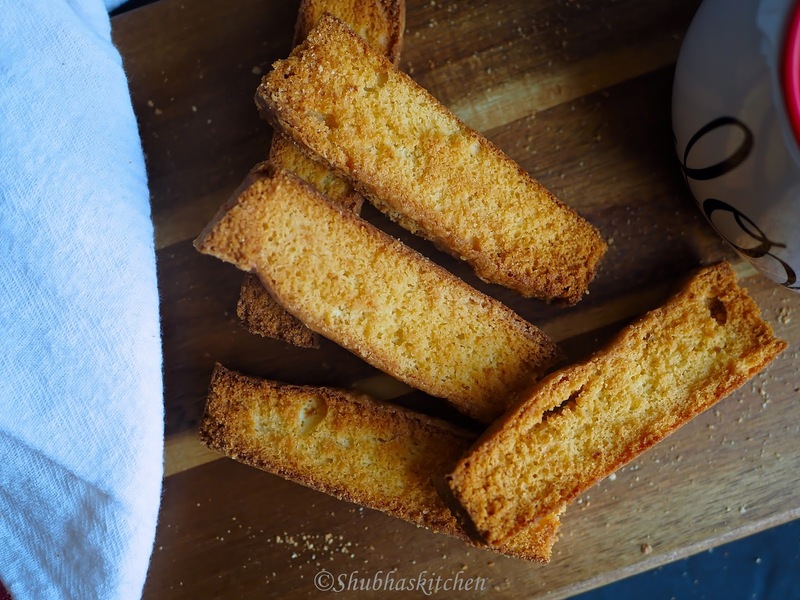 Remember, the rusk might be a little soft when you remove from the oven but when it cools down, it becomes hard and crispy. Spray some baking spray (I used PAM baking spray) to a 9 in X 13 in pan (If you don't own a baking spray, you can grease and flour the pan). In a mixing bowl, whisk together all purpose flour, baking powder and salt. Beat the butter and sugar in a large mixing bowl using a stand mixer until smooth. With mixer running on medium, add the eggs one by one. Remember to scrape down the batter in between. Add the vanilla extract. Mix. Slowly add the flour in parts with the mixer running on low. Lastly, add the milk and give a final mix. Pour the batter to the prepared pan. Bake for about 35 minutes. Remove and the cake cool completely (or at least for 20 minutes). Cut the cake into pieces as shown in the picture. 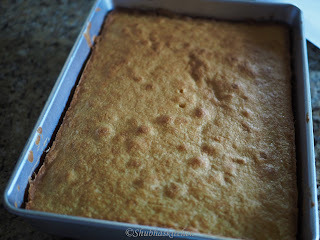 Prepare a baking sheet with parchment paper. Arrange the cake pieces/slices in the baking sheet and bake in the already preheated oven (@325 F) for 15 minutes . After 15 minutes, flip the pieces to the other side and rotate the pan and bake again for 15 minutes until it is nice and deep golden. Remove and set aside to cool . 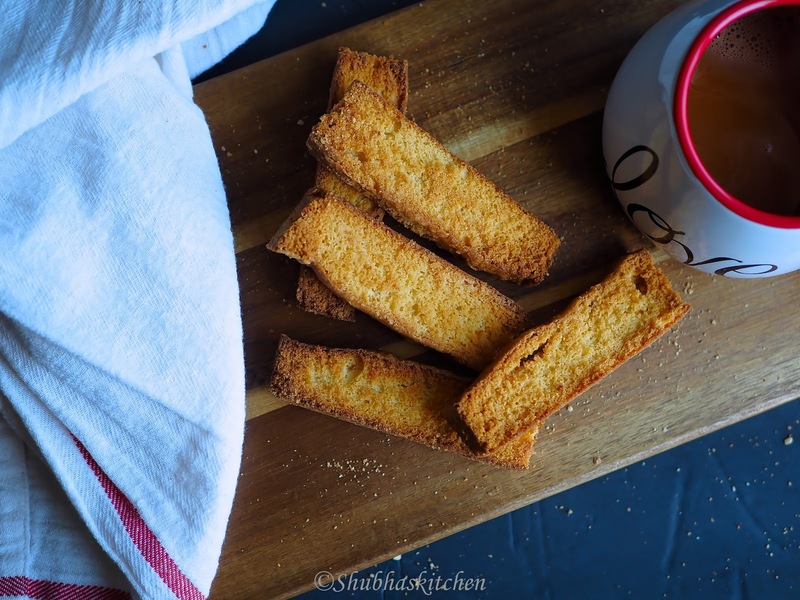 The rusk will become completely crispy once cooled. Store it in an air tight container. 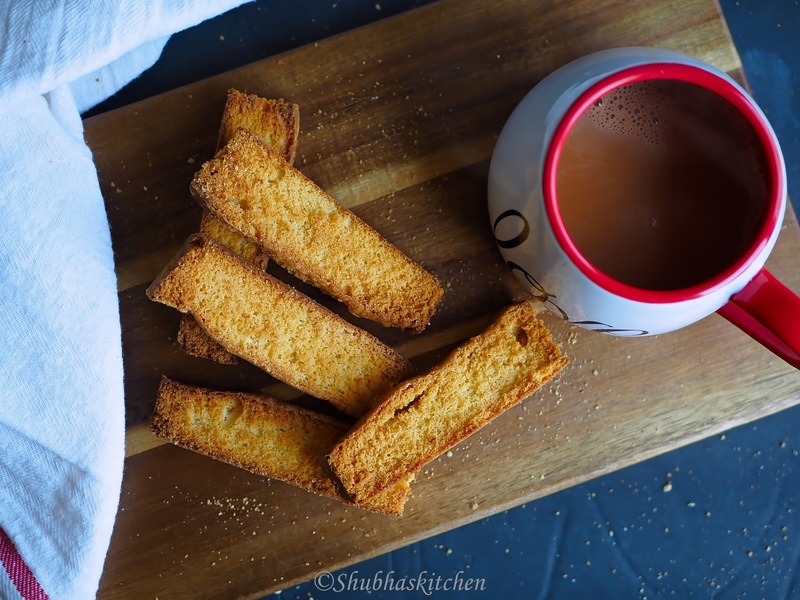 Enjoy these crispy cake rusk with tea or coffee. Cake rusks are totally addictive. I having one right now with my afternoon tea. Wow, what a fantastic recipe! I just love these too, dunked in tea! 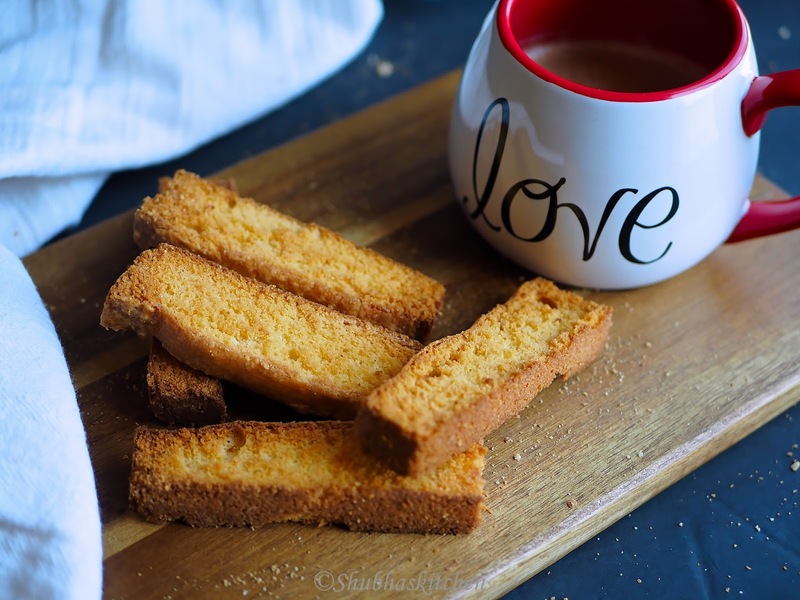 Cake rusks look perfectly crisp....Also a great way to store longer and enjoy it...Awesome share!! I love this idea you know what! these rusk are delectable. Awesome share.. Awesome. Sincerely, I can take my eyes off these rusk. 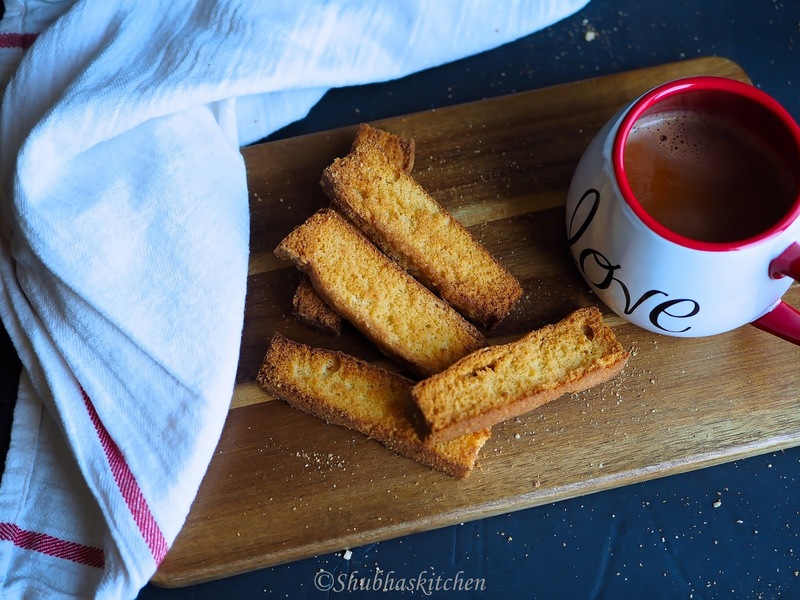 No better time is tea time over these crispy treat.